Digital nomads, remote workers, and long-term travelers lead a lifestyle that many people envy. We’ve run across countless people who are in awe of our ability to travel nearly anywhere in the world and still be able to earn an income (as long as we have decent internet connectivity that is). We’ve also noticed that people think our digital nomad and long-term travel lifestyle is an extended version of their typical two week vacations, where work worries are set aside and our days are filled with excursions and non-stop adventures and fun. We do of course have spurts of times like these, as we choose to take vacations just as anyone else does. However, overall we still need to work. So, we combine our travel with full or half days on our laptops. It’s just like a day at the office, we just happen to be in a hotel (or coffee shop, airport lounge, etc). As digital nomads and long-term travelers, when we stay at a hotel it’s usually for more than just a few nights. Plus, since we're combining our work with traveling we’re not sightseeing every day. At times, we spend full days in our hotel room, which means we look for a unique set of amenities in our hotel to make it more like a 'home'. Put away and lock up your valuables. Jewelry, laptops, travel documents, etc. should all be locked up and kept in the safe. Of course, overwhelmingly people are trustworthy and won’t steal anything, but why chance fate? No matter how nice the hotel is, we try to always lock up our valuables, primarily our laptops (Lenovo ThinkPad Ts series). For even more security our laptop drives are encrypted and the computers are protected with a complex password. They’re not only valuable, but as digital nomads our computers are our means to making a living and contain all of our data and work. It would be a disaster if we lost these bad boys! Plus, since everything we own fits in the single travel backpack we each carry, every items is precious and could be difficult to replace while traveling. We carry our most precious belongings with us even when leaving the hotel room and everything else is put in the safe or locked in our backpacks. Tip: Keeping our stuff tidy and organized helps us keep track of everything we own and not loose it. Be sure to read our article Keeping Yourself and Your Belongings Safer to see more tips on being safe and secure while traveling. Decline house keeping services and go a step further by only allowing hotel staff to enter the room while you’re there. As digital nomads we carry almost everything we own with us in our carry-on size travel backpack. Therefore, we’re particularly concerned with the safety of our belongings. Most people are overwhelmingly trustworthy, but we can’t chance loosing anything. To prevent loss, theft, or even something being mistaken as trash (we once had our DIY TSA liquid travel container of lotion thrown away in Istanbul! ), we post the ‘Do Not Disturb’ sign on the door to prevent housekeeping from entering our room. Yes, this means housekeeping won’t clean, but we didn’t have a cleaning service at home either, so no big deal. Plus, we can still ask housekeeping for fresh towels, more toiletries, and emptying of the trash if we need it. Tip: Additionally, we’ve found that housekeeping will sometimes enter the room without knocking. Therefore, leaving the ‘Do Not Disturb’ sign up even when we’re in the room allows for more privacy. We ask for extra of the free hotel toiletries and amenities at check-in, or we skip the ‘middle man’ and ask a housekeeper when we see them in the hallway. We generally need extra body wash (to hand wash our clothes and bathe ourselves), and since we aren’t asking for cleaning service, we also ask for extra shampoo, conditioner, lotion and hand soap. Also on our list of asks are extra pillows, towels, mouthwash, toothpaste, etc. The list varies depending on our needs and what the hotel provides. Tip: Typically being a member of a hotel rewards program (especially elite levels) will give you access to more free amenities. See how you can make the most of your hotel elite status with our Hotel Hacks for the Digital Nomad and Long-Term Traveler article. Asking for extra water is particularly helpful in countries where it’s inadvisable to drink the tap water. Plus, most hotels we stay at offer free bottled water as a benefit of being a part of their rewards program. We always ask for extra water at check-in and have had about a 90% success rate getting a few extra complimentary bottles. A fridge and microwave save the day! While in Europe, we were surprised by how many standard hotels didn’t offer microwaves, so we felt incredibly fortunate when we had a room or were upgraded to a room with this amenity. 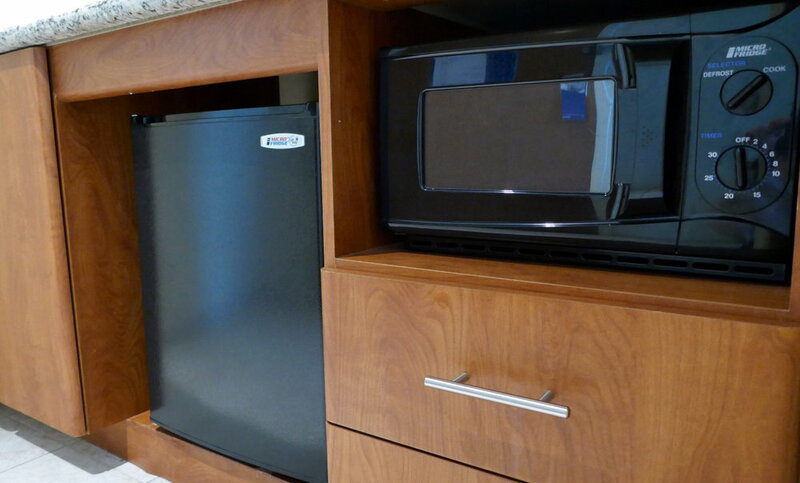 Upon checking into our room, one of the first things we ask for is the mini-bar (a fridge filled with usually outrageously expensive drinks and snacks) to be emptied. We want the space to use the fridge for our own items and it has the side benefit of ensuring we aren’t mistakenly charged for something we didn’t consume. Tip: We find that shopping at grocery stores for meals is not only relatively inexpensive, but also a great way to experience a city more like a local. At first, making meals in a hotel room can be a bit of a challenge, so be sure to read our Top Tips to Save Money on Food and Supplies When Traveling for some great tips! We ask for place settings at check-in and wash the dinnerware each night in the sink, just as we would at home. The only time this request has been declined was at a hotel that didn’t offer food services and therefore didn’t have a kitchen. 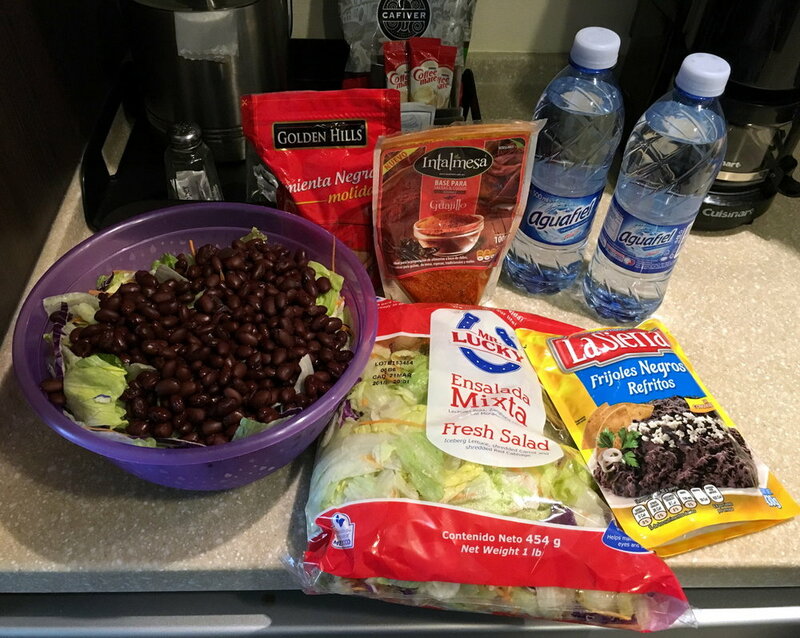 Tip: Many of the meals we have at a hotel are hearty salads (think a bag of pre-cut greens with added vegetables, beans, and other things we find at the grocery store) and therefore require large bowls to prepare and eat out of. When we just ask for a bowl we often receive small bowls (think yogurt or cereal bowls). However, we've found that asking specifically for 'large salad bowls' (or showing a picture of one in countries that don't speak English) yields better results. If your hotel room doesn’t come with something you need or would like (i.e. a tea kettle for heating up water) don’t be shy, ask for it! More often than not hotels have items that aren’t placed in the guest rooms unless requested. As digital nomads and long-term travelers, many of our days are filled with hours of working on projects and communicating with clients and customers. So, inevitably our hotel room becomes our office and therefore we really appreciate having the amenities we’d have access to in a traditional office. There are of course hotels geared specifically towards business and long-term travelers, but over time and experience we’ve discovered there are things we can do to make any hotel more work accommodating. Ask for an early check-in and a late check-out. Checking in early and checking out late means we can maximize our productive time in the hotel room. We’re more productive when we have a continuous and uninterrupted block of time to work. So, it’s helpful to get an early check-in (i.e. 12 noon) and have a full afternoon for work. On the other end, checking out late (i.e. 3 pm) allows for an entire half-day that can be dedicated to work. We don’t always use the full time of the early check-in and late check-out, however we appreciate knowing we have the option. Tip: Getting an early check-in or late check-out is generally up to the hotel and depends on room availability. Some hotel rewards programs, like Hilton, have a perk that guarantee late checkout, so check with your favorite branded hotel to find out more! 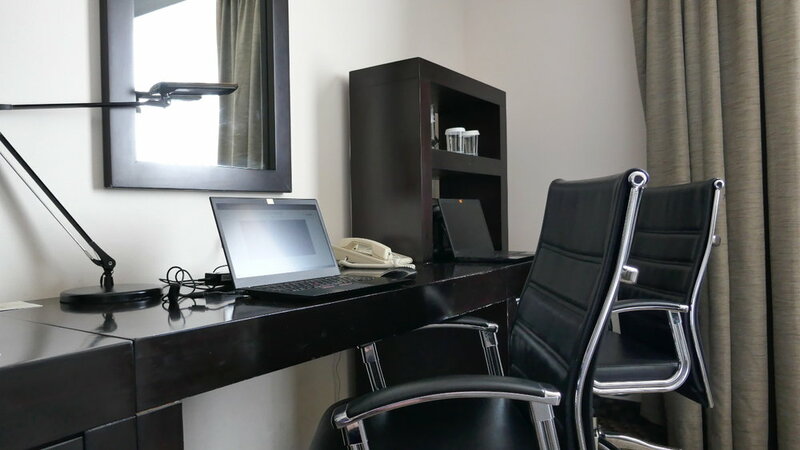 When our hotel room becomes our office, we need a place to work that’ll be productive and comfortable. Before booking we double check that our hotel room will have a desk and when we arrive we ask for a second desk chair in the room. In the beginning we asked for just a second chair but we ended up with a variety of chair types, some quite comical and others very uncomfortable for working at a desk. Our request for a second office desk chair isn’t always accommodated, but when it is, our productivity and comfort are dramatically improved. Fast and reliable internet connectivity is vital to a digital nomad’s lifestyle and ultimately their income. Before arriving we check with the hotel ahead of time to make sure that internet access is included with the cost of the room. Sometimes getting free internet access is a simple matter of being a member of the hotel rewards program. We’ve had mixed results, but often times when we’re kind and make conversation with the person checking us in and explain our reliance on the internet, we’ve been able to get complimentary login codes. Just know, YMMV (your mileage may vary). Tip: Once we arrive, if we find the connection to be too slow, sporadic, or blocking VPN traffic we’ve had success in asking if there’s a secondary network (like a convention center or employee ‘only’ network) that we can connect to. Again, YMMV! 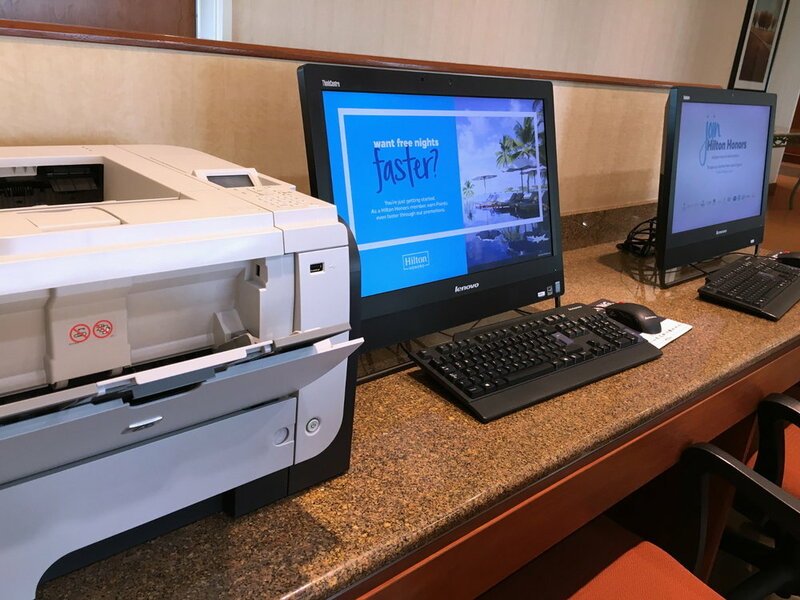 We sometimes need to print documents, so we make use of the hotel’s business center when possible (or we get creative!). Also, for the safety and privacy of our and our clients’ information, we use two-factor authentication (2FA) and/or an encrypted USB drive to access documents that need to be printed. Tip: While we firmly believe that most, if not all services with a log-on should use two-factor authentication, this is unfortunately not yet a reality. So, to find out what services offer it, which are working on it, and which ones you need to email asking for it to be implemented, check out Two Factor Auth. 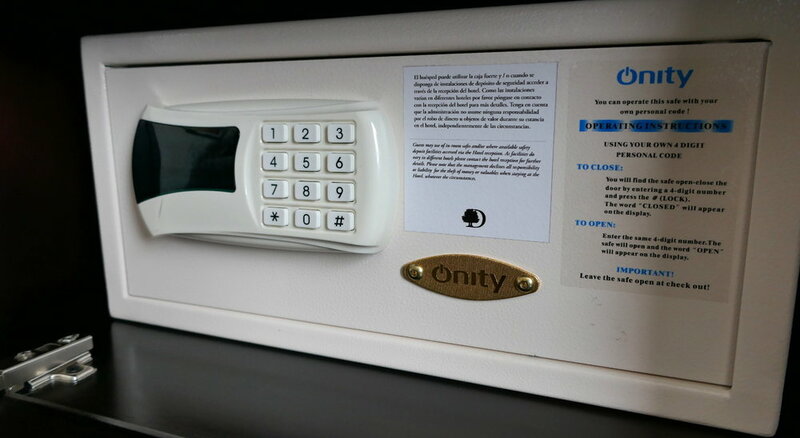 It's becoming more and more common for hotels to require a room key to keep the electricity on in a room. Since we take our keys with us when we leave the room, the presumption is that when we leave all the lights will turn off. This make sense and is environmentally conscious since we don't need the lights on when we're not in the room. However, we still need our devices (e.g. battery packs, camera batteries, etc.) charging when we aren't in the room. Plus, in especially hot environments, like Cairo, Egypt, Marrakech, Morocco, or Santiago de Queretaro, Mexico, we like to keep at least the fan on, if not a minimal amount of air conditioning. Since many of the card slots don't have an RFID reader, simply placing any card (like a business card, playing card, or old gift card) in the slot will do the trick. This works well, but since we don't carry cards around, we find it even easier to just ask for an additional key card at check-in. Either way, problem solved! Even as a digital nomad you never know when a pen and paper will come in handy. Luckily, most hotels will have a pen and stationary set in the hotel room. If they don’t, just ask, they’ll probably have something handy that’ll help you out. Tip: We’ve found it very helpful to travel with a mini-pen and a mini-sharpie. Whether we’re taking notes, filling out customs cards on arrival to a country, or labeling toiletries, they’ve always come in handy! As digital nomads and long-term travelers, we know our needs are different from a typical vacationing hotel guest. If our hotel stay is just a night or two we can overlook some comforts, but because we often stay longer, ‘comforts’ become ‘needs’. The check-in and first day of our stay can be full of several requests to hotel staff, but we’re extremely kind and appreciative of their help. We’re also very self-sufficient during our stay and need very little attention from the hotel staff after the initial check-in process, which we’d like to think is much appreciated.